For a while now researchers at MIT and several other universities have been investigating methods for using frequencies in the WiFi bands to see through walls using a form of low power radar. The basic concept is to track and process the reflections of these signals from peoples bodies. This paper demonstrates accurate human pose estimation through walls and occlusions. We leverage the fact that wireless signals in the WiFi frequencies traverse walls and reflect off the human body. We introduce a deep neural network approach that parses such radio signals to estimate 2D poses. Since humans cannot annotate radio signals, we use state-of-the-art vision model to provide cross-modal supervision. Specifically, during training the system uses synchronized wireless and visual inputs, extracts pose information from the visual stream, and uses it to guide the training process. Once trained, the network uses only the wireless signal for pose estimation. We show that, when tested on visible scenes, the radio-based system is almost as accurate as the vision-based system used to train it. 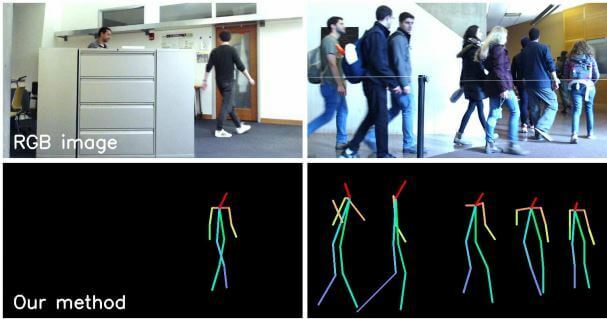 Yet, unlike vision-based pose estimation, the radio-based system can estimate 2D poses through walls despite never trained on such scenarios. The hope is that this technology could one day be used as a replacement for camera based computer vision. It would be a non-intrusive method for applications like gaming, monitoring the elderly for falls, motion capture during film making without the need for suits and of course for gathering data on peoples movements. It is not mentioned in the paper, but it is likely that they are using some sort of SDR like a USRP for receiving the signals. It's possible that a lower resolution system could be set up cheaply with a HackRF and some passive radar software. RF Pose Estimating Human Pose Behind walls using RF signals in the WiFi frequencies. It would have been interesting to find some information on their design and which choices they madee.g. band, modulation or required bandwidth and antenna resolution. The paper discusses mainly the priciples and provides references to previous work in 60 GHz  and WiFi , , , but it does not reveal their RF-design, e.g. figure 3 shows a horizontal and vertical antenna aray, but are the antennas arrays used for receive and/or transmitt, do they use beam-stearing or seperate receiver per antenna. Would this Wifi work on a boat as a short range warning radar. Would the fact that 2.4ghz frequency is the same as a Microwave oven and boils water be an advantage. i.e. Will the wifi signal transmitted from the boat be absorbed by the surrounding water but reflect off anything on the water.